As France developed an increasingly full set of civil as well as military medals, it developed parallel awards for the colonies. In Indochina they were bestowed broadly on the notables to encourage diligence and loyalty to France. 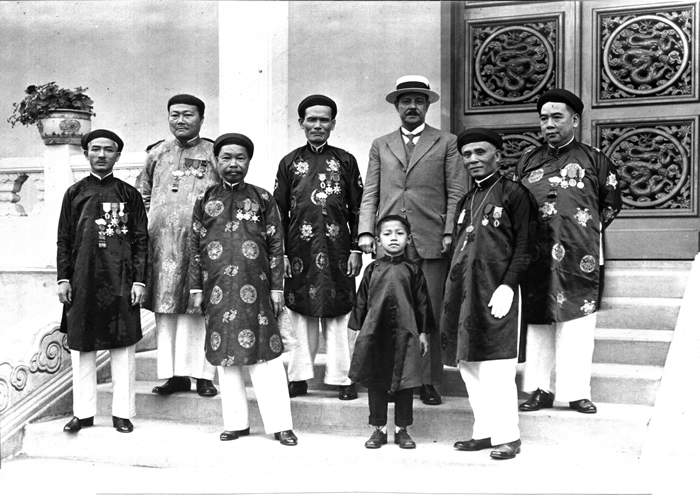 Old photographs of high mandarins in their traditional tunics often show them wearing an array of awards which might include the Kim Khanh, sometimes with the Tien suspended below; an ivory or gold Bai; the Legion of Honor; the Order of the Dragon of Annam; often the Royal Order of Cambodia, and perhaps the Order of the Million Elephants and White Parasol ; the French or Annamese Agricultural Order ; the French or Cambodian Academic Palms ; the Indochina Merit Cross ; and the Honor Medal of Courage and Devotion. Those who had served in the French armed forces or constabulary wore the French military medals, and those senior in the various Indochina services might have the award of that service. Cambodian and Laotian officials, or course, would have the awards of those states, including the orders and reign medals. The French civil medals were usually the creation and gift of individual ministries -- the Ministry of Justice, for instance, presented the Penitentiary Service Medal. The Ministry of Colonies had a number of its own awards for use in the colonies to replace the Metropole awards, one being the Colonial Penitentiary Service Medal. Others included the Colonial Public Education Medal, the Medal for Epidemics, and the Honor Medal of Courage and Devotion. 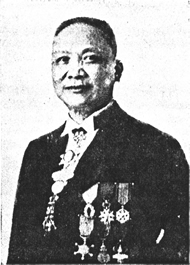 The civil medals made specifically for Indochina were created and awarded by the authority of the Governor General. The different services in Indochina were staffed by personnel usually seconded to the Ministry of Colonies and placed under the authority of the Governor General. Some of the medals are original and distinctive designs, like the short lived Military and Native Guard Merit Medal and the Indochina Merit Cross. But most of them have fully the French flavor, and may differ from the Metropole and Ministry of Colonies Design only in having the inscription INDOCHINE FRANÇAISE.